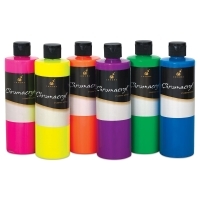 Chromacryl is a multi-purpose, creamy, consistent, and flexible acrylic paint that can do it all, from finger painting to printmaking to screen printing on T-shirts! It's non-toxic, it mixes and cleans up in water. Chromacryl's "Common Sense" color mixing system is based on the Warm Primaries/Cool Primaries theme. To obtain the purest mixtures and avoid muddy paintings, follow these guidelines: Mix Cool Red with Warm Blue for violet; mix Cool Blue and Cool Yellow to get a bright green; and mix Warm Red and Warm Yellow for brilliant oranges. Starter Pack — Contains 96 tubes, with .65 oz (20 ml) in each tube, including 12 each of Cool Blue, Warm Blue, White, Black, Cool Red, Warm Red, Warm Yellow, and Cool Yellow. 5-Tube Set — Packaged in an attractive box that makes a great gift or back-to-school package, this set includes Cool Red, Cool Yellow, Cool Blue, White, and Black. Tubes are 2½ oz (75 ml) each. 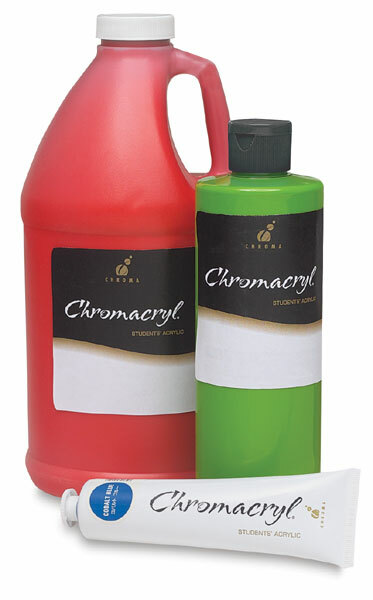 Textile Medium — This medium is essential in order to use Chromacryl as a textile paint. Mix 1 part of medium with 2 parts paint to make a printing ink or painting medium. When Textile Medium is used, Chromacryl Acrylics have excellent bonding properties with most fabrics. Heat set the fabric in a normal manner after the design is completely dry, using a hot iron. Neon Pints, Set of 6 — This set includes 16 oz (pint) bottles of Neon Blue, Neon Green, Neon Orange, Neon Pink, Neon Violet, and Neon Yellow. Primary Pints, Set of 6 — This set includes Pint bottles of Black, Cool Blue, Cool Red, Cool Yellow, Green Deep, and White. Bright Pints, Set of 6 — This set includes Pint bottles of Cobalt Blue, Magenta, Green Light, Orange Vermilion, Violet, and White. Pump Lid For Half Gallon — Use pump lids in the large Half Gallon (1.92 L) bottles. Pump lids mean no more spills or messy containers.